Today is release day for my debut novel. On December 29, 2012, I first sat down to write that novel. On the day of the fifth anniversary of my father’s October 13, 2007 death, I decided to write a novel inspired by my caregiving experiences as his Alzheimer’s care manager. I was certain novel writing would be a huge undertaking because up to that point, I had never written fiction. Because of the enormity of said project, I figured I would wait until the beginning of the following year – you know, a fresh start and all. Now’s perfect to start a new writing project; no need to wait until next year. Put down your thoughts without worrying about form, one word at a time. I showed the horoscope to my husband and if it at all possible, he was more shocked than I at the horoscope’s content. He left me alone the remainder of the day, knowing the horoscope meant business, and so did I. I closed the door to my office, sat at my computer and started typing. I didn’t know what I was doing. As I mentioned earlier, I had never written fiction. At that point, my personal blog, Living: the ultimate team sport was filled with 100s of non-fiction pieces, most of which centered around aging, long-term care, as well as numerous posts about Alzheimer’s disease, other dementia, and the caregiving struggles faced by families. But to write prose – with dialogue!!!!! – was beyond my skill set, and remained to be for quite some time. The short of the long of it is that Requiem for the status quo was not the first title for the novel, there were many, the first being Have we met? Aren’t you glad I changed it to its current one? Not only were several titles tried on but my magnum opus went through many rewrites, most notably and importantly, the first draft contained a whopping total of 140,000 words. You see, I had a lot to say and I just kept typing until I had nothing more to add. That’s an excellent way to get thoughts down on paper, but the first draft is by no means the final product that is pitched to agents and publishers. My now published novel is less than 68,000 words. Yes, lots of cutting and slashing took place over the years, to the point where not only am I proud of the finished product, but a publisher is also proud of it, Black Rose Writing. I will close this post by providing glimpses of my father to you over the years. 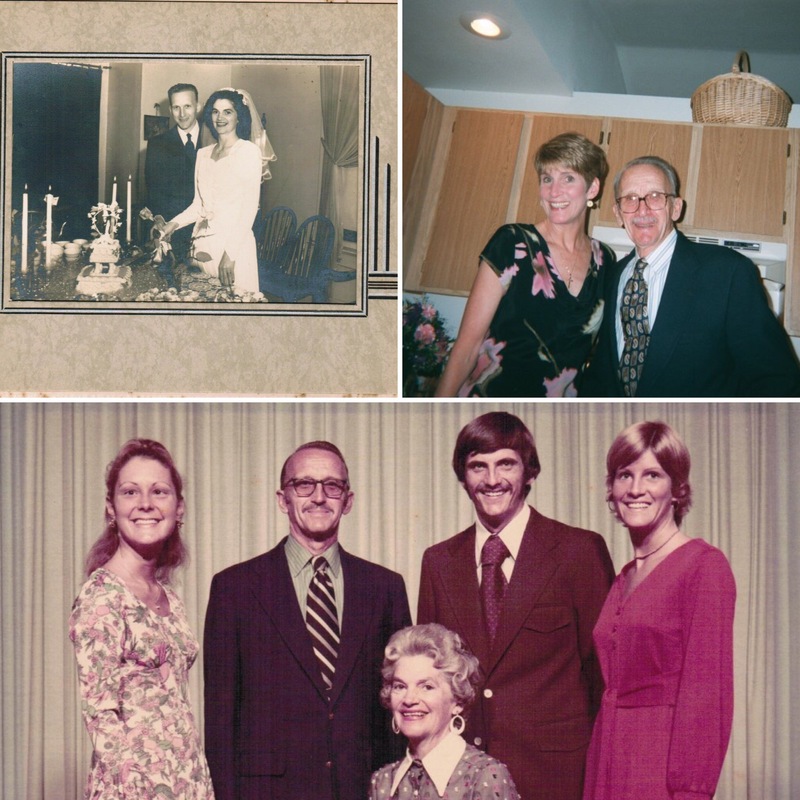 I hope you enjoy this montage that includes, from top left: My mother and father’s wedding day, 1947; my wedding day 2000 (my favorite photo of my dad and I); and the Desonier family circa 1971. This entry was posted in 21st Century Living, Alzheimer's/Dementia, Caregiving, Family issues, Health & Wellness, Personal Struggles, Quality of Life, Writing Updates and tagged Alzheimer's and other dementia, Black Rose Writing, long-term care, Requiem for the status quo. I loved the story of your serendipitous horoscope. Most of the time we get whispers pointing us in the right direction. It’s good to know sometimes we hear a shout. To be sure, Theresa, I simply couldn’t ignore that shout. Looks like it was meant for me. Happy book birthday, Irene! I’m loving the photographs. Your father is smiling down on you today. Thank you, Jill. Yes, I think he would be happy with what I’ve done with his and my experiences. Wonderful, Irene. Today is a proud moment indeed – for you, our family, and most of all – our amazing and caring Dad. And, I love the photos. What a beautiful montage!! With much love, your grateful brother. Thank you, Don. It’s hard to believe it’s finally here. In the grand scheme of publishing matters, however, contract signing to book release date was only five months. That is UNHEARD of in the industry. I’m so glad it was for me.